In the last five years, the work of George Meertens has undergone a significant development, one that he himself refers to as a voyage through uncharted waters. That search was guided by a number of questions he put to himself: How does one paint the invisible? Or transform an inner experience into a painting? And how do you put a title to the evolved images, which must then find their own way in the world? After graduating from St. Joost Academy in Breda in 1981, George Meertens experimented with various artistic options and points of departure. 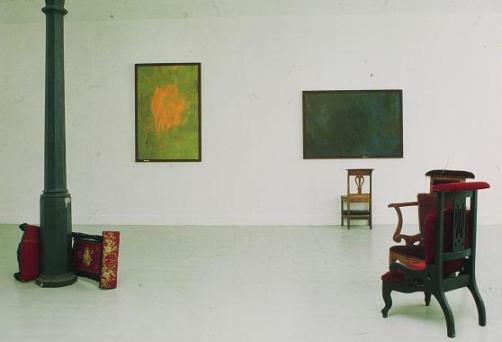 His first exhibition, mounted in 1989 at Lokaal 01, an artists’ initiative in Breda, was in the nature of an installation. On the lower floor, his commentary on the typical Sunday trek from church to café consisted of abstract paintings in combination with café chairs mounted on eggs, while in an upstairs room a number of prie-dieus were arranged, lying on their sides or piled on top of each other. His 1994 exhibition at Stichting Archipel in Apeldoorn displayed a rational and systematic approach. In the project entitled Tijdmachine (Time Machine), Meertens developed a concept of comprehensiveness. With the aid of a computer, he drew up an inventory of the possible images, based on the number of colours and pixels on a monitor screen. He also developed a new perspective called Total Perspective, which was capable of overseeing the surroundings in 360 degrees, like an all-seeing eye. These formed the building blocks for two computer sculptures, a screen print, and a series of black-and-white paintings. All these activities took place against the background of a passionate public debate on the future of painting. Meertens felt that, as an artist, he had a duty to clarify his position with respect to the new media, and he began to experiment with the specific possibilities offered by the screen. At the same time, he continued his painting, convinced as he was of the added dimension it offered. Meertens’ return to painting represented a new beginning. Figuration gave way to abstraction, colour returned in all its myriad nuances, and the typical expressive qualities that had receded into the background in the cityscapes he produced between 1995 and 1997 again came to the fore. The artistic issues he has addressed since then have remained largely the same. His goal is still to find the image. But what kind of image? When can you be sure you’ve got it right? When is it finished? When have you overshot your goal? The manner in which Meertens now addresses questions like these – which touch upon the very raison d’être of painting – is new. In a 1994 interview prompted by his project Tijdmachine (Time Machine), Meertens admitted that initially he had trouble getting to grips with the search for that one exclusive image. (3) But thanks to the computer, with its wealth of images, there was no longer any need for such highly subjective choices and decisions, which meant that he could focus on other issues. In recent years, the search for personal and appropriate images has again become the central factor guiding his art: images that derive their justification not from objective systematics, but from the intrinsic necessity that spawned them. Na de Zondvloed (After the Deluge, 2005) is one of the first paintings Meertens did after those years of soul-searching. This small, horizontal canvas consists of clearly recognizable strokes of grey, blue, ochre, brown and pale pink. The range of colour, the liveliness of the brush strokes, and the depth – together with the title – evoke associations with submerged land. The paintings that followed also have a scenic aspect, but one that arises from an intuitive, lyrical manner of painting, rather than from any need to portray visible reality. Meertens’ approach to nature crystallized out in the enormous diptych entitled De bossen buiten Clairvaux (The Forests outside Clairvaux), completed between 2002 and 2008. The two canvases, each 235 x 435 cm, are rooted in the way the paint is applied. When viewed from close by, the surface seems to explode in a whirl of greens, browns and ochres tumbling over one another. From a distance, however, they appear to merge, forming a dynamic space through which the observer is free to roam. In De bossen buiten Clairvaux (The Forests outside Clairvaux) Meertens abandoned figuration in favour of the internalized image of a forest: an image that encompasses the memory of flickering sunlight through a canopy of foliage, the smell of moist earth, and the pulsating life which lies beneath the bark of the trunk and within the ribs of the leaves. Not only nature, but also the human body is a central theme within Meertens’ work. And again, it is not the tangible, physical body that interests him, but the ‘inner space’. In one of his diary entries, he refers to ‘the deep experience of an existence which converges in the sentient, perceptive body’. In the large standing canvas entitled Lichaam (Body), dating from 2006, he has strived to express that experience by means of paint: colourful strokes, applied layer by layer, in a variety of tints, formats and directions. Some strokes stand out, while others are no more than wisps of paint. Some overlap, others appear side by side. They are part of a painting process that will continue for as long as it takes for the brushstrokes to find each other in an open, expressive weave. ‘Listen, my son (...) and incline the ear of your heart’. These are the opening words of St. Benedict’s Rule for Monks: words that are close to Meertens’ heart. In his painting, he strives to put into practice that call to ‘listen’, by casting aside all preconceived images and responding only to what is going on during the painting process. As a result of this approach, whereby the artist ‘feels his way’, searching for a structure and a cohesion which cannot be predicted beforehand, he is often confronted with an impasse. ‘It is this impasse which determines the progress made. The Chinese character for ‘crisis’ signifies both danger and chance. This impasse is the low point, the nadir. One cannot sink any lower. In his diary, Meertens refers to this as the locus horribilis, an expression in common use among Benedictine monks. Introspection, deliverance and catharsis: these are timely concepts, relevant not only to Meertens’ personal life, but also to his art. Since 2009 he has employed the term Sublacus, another concept borrowed from St. Benedict. The Latin words sub lacus refer to the place to which he retreated during his life as a hermit: a grotto near the lake, at the lowest point. For Meertens, Sublacus has come to mean a place and a time to ‘contemplate the error of your ways. To learn how to live with yourself. A place that seeks the silence of the hours. It is a dangerous place, one which can be implacable and should only be visited in Love’, as he wrote in his diaries. The studio may also be seen as the Sublacus, where the artist strives to let go of certainty, and where he is sometimes rewarded with a ‘moment of grace’, when mind and body converge during the act of painting. In the paintings dating from the past two years, not only the colour, but also the act of painting itself becomes an important bearer of meaning: it allows itself to be guided and inspired by reflections on nature, life and spirituality, but ultimately it must come to terms with the support, the paint and the brushes, if it is to become an image. Meertens’ paintings are composed of layers: in some works only a few, in others dozens. In the last two years, the small brushes he used for such works as De bossen buiten Clairvaux (The Forests outside Clairvaux, 2002-2008) and Lichaam (Body, 2006), have been replaced by broader brushes and a variety of painters’ tools, ranging from wooden slats and rags, to paint scrapers, the floor, and his own hands. Thanks to the different processes which the paintings undergo, patterns emerge which the artist could not have conceived of beforehand: the surprise effect of the turpentine, the remains of paint left behind on the lat used to distribute the paint across the canvas, or the fusion of the paint layers during the process of sanding, scouring, and scraping away the paint. In contrast to the processes of application and removal, there is the conscious decision to refrain from action. These are moments of ‘stepping back’, which are dictated by the characteristics of the oil paint itself, which must first come to rest if it is not to dissolve into a grey mass. Standing in front of the finished painting, one’s attention focuses on the image, but the sides also have a function. Their dinginess reflects the genesis of the work. In Meertens’ words, they reveal the restlessness of his work, the mud and dirt out of which the image has emerged. In this sense, they are an inextricable part of the image. Concrete as they are, the works on paper are an important element in Meertens’ striving to lend the act of painting the expressive power of an image. The series Liederen (Songs, 2009-2010) took shape almost casually, like the humming of a melody that suddenly comes to mind. For these works, he makes use of the brushes just as he finds them in the jars of turpentine on his workbench. Painting is reduced to an elementary operation: the patterns are simple and guided by the impulse of the moment. When there is no more paint left on a brush, Meertens selects a new one at random. Some sheets are almost watercolours, due to the remains of turpentine left on the brush. Others are ‘drier’, revealing the traces of brushstrokes on paper. The works are largely monochromatic, with here and there a remnant of colour visible through the green, brown or ochre base coat. The natural directness that Meertens achieves in these works, as in his recent series entitled Stemmen (Voices), prompted him to strive for that same clarity during the painting process. In the large painting entitled Grote stem (Large Voice, 2010), that process was reduced to just a few operations. There is the pale blue of the smoothly painted background, the brown applied in long vertical streaks with a broad brush, and the horizontal movement whereby the paint is scraped off. The structure that originates in this manner is both sober and arresting. Here and there, the colours are so fused with one another that it is impossible to say whether you are looking at brown over blue or blue over brown. When it comes to tone and emotional charge, there are clear differences between the various works. They range from the drama and melancholy of Wond (Wound) and Tranen (Tears), to the tenderness and joy of Licht (Light) and Bemin (Love). They also differ in format and ground. In the present publication, Meertens has arranged the paintings and the works on paper according to format and ground, often characterizing them by means of a single word. The Studies in Verlatenheid (Studies in Desolation), De Liederen (The Songs), and Stemmen (Voices) are on paper, while the Brieven (Letters), Gesprekken (Conversations), Uren (Hours) and Sublacus are on canvas and range in format from small and intimate to monumental. Do what the painting-in-progress demands, and strive for clarity in all things: these are the principles that guide Meertens’ approach to painting. What binds all his work is its intensity. Ultimately, painting is about involvement and attention: these are qualities that not only lend a work body and soul, but also provide comfort and healing. In his search for the image, Meertens has come closer and closer to the act of painting itself, while the references to visible reality are increasingly relegated to the background. Each painting tells the story of its own genesis, revealing its essence in the colours and the processes from which it has emerged. The path leading to the image has become the image itself. Published in: George Meertens - Sublacus (text Hanneke de Man), Document 2011, Timmer Art Books - Oosterhout, 2011.